I had such a wonderful discussion with Ina Sonnenmoser, the driving force behind the pattern website http://www.pattern-collections.com. Ina's depository has patterns of all kinds, not just tangle patterns. Among many other things, we discussed the POWER OF REPETITION OF PATTERNS. A pattern (tangle or not) by ITS VERY DEFINITION is a design or action that is REPEATED MULTIPLE times, and that is what makes a pattern! 1. a repeated decorative design. "a neat blue herringbone pattern"
"the pattern on the wallpaper"
an arrangement or sequence regularly found in comparable objects or events. "the house had been built on the usual pattern"
a regular and intelligible form or sequence discernible in certain actions or situations. "a complicating factor is the change in working patterns"
"the patterns of ant behavior"
In the Zentangle Method, repetition is encouraged so that you find ways to make each tangle your own, discovering the rhythm of the pattern and learning it by heart. By repeatedly using the same tangles, you find connections and possibilities that you wouldn't find by only using the pattern sparingly. We encourage you to practice these tangles often so that you can make them your own, explore their possibilities... form your own relationship with them. 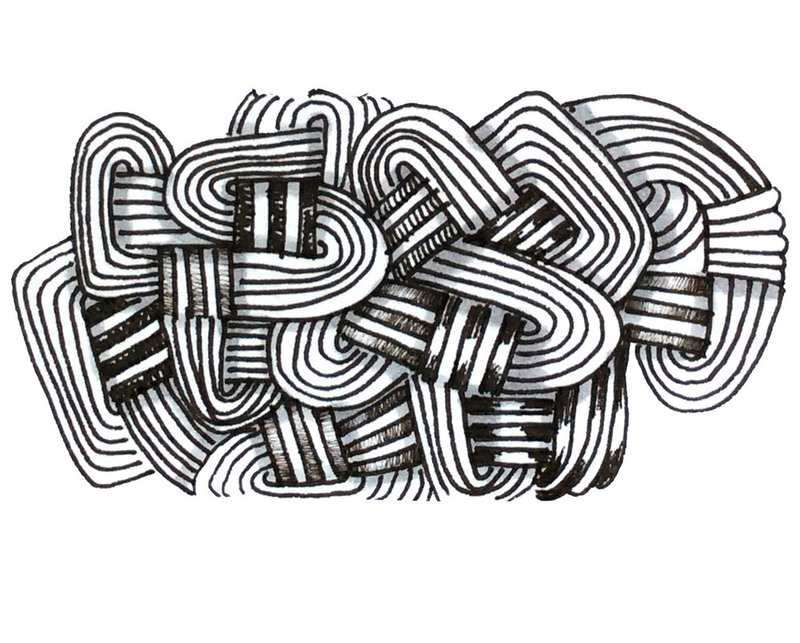 As you tangle repeatedly, you will discover aspects and possibilities that were not obvious when you first drew it. Additionally, repetition of any single pattern ON THE SAME TILE also allows you to enter that magical zen state which artists are so familiar with, where you lose track of time and of the world. It's wonderfully healing and relaxing to not have to think of anything else. Traditional art usual requires much more deliberate composition, thinking about the design of each individual component. That's one of the reasons why I love patterns and tangling -- and especially monotangles, where you use one single tangle on the entire tile . To be free to not think too hard about the project! So how much repetition is needed to be free? Technically speaking, if you create a pattern twice, you are repeating it. However, in my experience, I find the most joy in using a pattern as often as I can, at least 6 times in the same piece of art. • Practice a single tangle pattern on a sketch book. Find different ways you can draw the essential pattern. Become familiar with it! These are tiles that have only one tangle pattern. Every once in a while, create a monotangle to give you a really solid feeling for the tangle. If you are interested in creating monotangles, then check out Tasmin Rootman's fabulous Monotangle Adventures Facebook group here. Have a set of go-to tangles, that is patterns you use all the time, especially useful to combine with a new tangle pattern you haven't used before. In this tile you see how I used Pepper -- a rather tricky tangle to make look 3D -- combined with my comfort tangles IX and Printemps.